I read this article and found it very interesting, thought it might be something for you. The article is called Thanksgiving Travel for Vegans and is located at http://www.gardendish.com/thanksgiving-travel-for-vegans/. Do you travel by train, plane, or automobile to visit family and friends at Thanksgiving? Does it still seem miraculous that you can start the day at home and be hundreds or even thousands of miles away by nightfall? It was about a decade ago that Caroline and I decided to forego the speed – and long lines and hubbub – of air travel in favor of the slower pace of the car for our annual trek to visit my family 500 miles away. But oh, the perils of Thanksgiving travel for vegans in cars – like the rest stop vending machines chock full of tempting goodies (or should I say, baddies?). There’s also the siren call of the roadside billboard beckoning you to a colorful, brightly-lit, fast food restaurant. It’s hard to say “no” when you’re tired and hungry. What’s a vegan to do?!? For Caroline and me, it starts with planning and preparation. 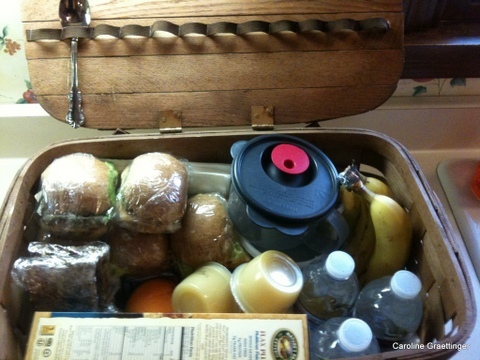 Figure out which of your own goodies you’d like to have handy. 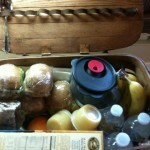 We load up a picnic basket or cooler with food items that travel well: fruit (bananas, apples, and grapes), raw veggies (carrot sticks, celery, and even cauliflower go great with hummus or just plain), sandwiches (homemade bean burgers are great), and drinks (bottled water or apple cider). And don’t forget the napkins and paper towels. Packing your own food will save you money, will save your waistline, and will save you from the gross feeling you can get after an ill-advised stop at an exit ramp café. If you do want to stop at a restaurant, you can make good choices with some more planning and some help from technology. You probably have some idea about where you’ll be when you want to stop for a meal. Before you leave, check out your options online (Google “restaurants Toledo Ohio” or use a vegan/vegetarian-specific site like happycow.net). Or, if you want to be more spontaneous, you can use a smart phone app like Yelp to navigate your way to a tasty – and healthy – eatery. With a little forethought, trips to visit your family and friends can be really enjoyable adventures. And they can be a relaxing opportunity to think big thoughts, to talk about goals, dreams, and aspirations. Happy traveling and Happy Thanksgiving!